Whether you “pack it in” or “park and unpack,” Thermacell will keep the blood-sucking hordes out of your camp. Avid outdoor enthusiasts know few things sap the fun of wilderness camping quicker than dive-bombing black flies or clouds of angry mosquitoes. Sure, you can slather yourself with insect repellent and hope for the best, but who wants to hit the sack on a balmy late-summer night with gunk all over you? Not us! In case you haven’t heard, there’s a company called Thermacell that has handily solved this problem. Best of all, you can toss that slippery, smelly bottle of insect repellent in the trash and never look back. All of Thermacell’s insect repellent products designed for camping work on the same principle: a small, butane-powered grill heats a mat infused with allethrin (a synthetic compound that mimics the natural insect-repelling qualities of the Chrysanthemum flower). Once the mat heats up, the repellent vaporizes and disperses into the air, providing a 15×15-foot dome of protection around the device. For backpackers or trailside campers, this protective dome easily covers the typical campsite footprint. How well does it work? The effectiveness of Thermacell’s patented technology exceeds that of any other insect repellent system on the market. It does its job so well, in fact, that the U.S. Department of Defense has deployed the product across the globe…from the soggy jungles of Costa Rica to the arid Middle East. That’s a testimony for even the most skeptical and discerning camper. 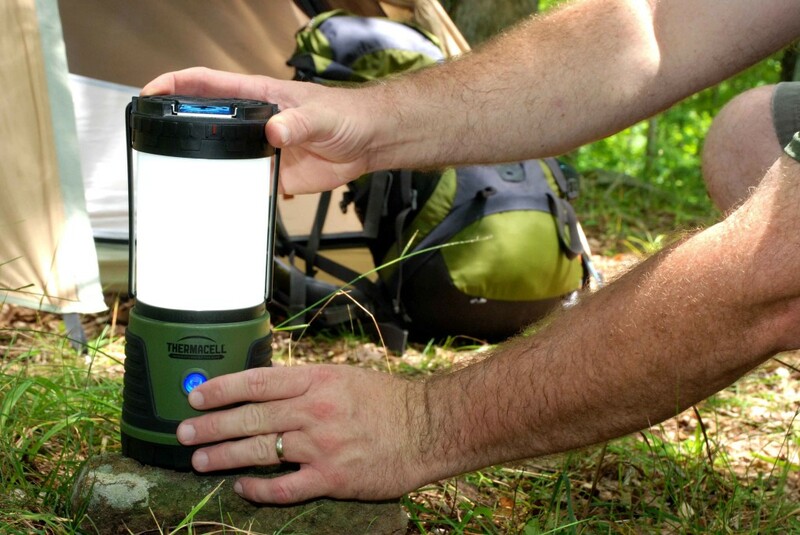 The newest Thermacell product is the Repellent Camp Lantern. As the name implies, this is a two-in-one device that has the unenviable task of both lighting your camp area (which attracts insects) and simultaneously keeping said insects out of your camping zone. That’s a tall order, but one the Repellent Camp Lantern manages quite easily. The lantern has a weighted, non-skid base, so it sits firmly on rocks, logs, or uneven ground. Four D-cell batteries power the light, which has four settings (low, medium, high, and flashing SOS). The Thermacell butane cartridge sits inside the dome. On top is the heating element and grill. The repellent mat fits between the grill and a grate. To use, simply rotate the start ring on top of the lantern to activate the gas and heating element. Once the mat heats up and the repellent disperses, you’ll enjoy bug-free camping for three to four hours before it’s time to change the mat. Each butane cartridge will last nine to twelve hours. 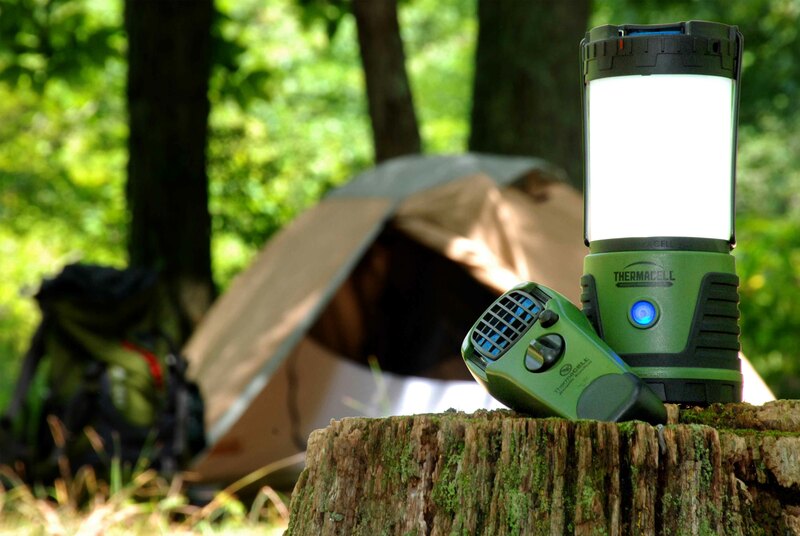 Trailside campers and short-duration backpackers will appreciate the combined wide-area lighting and insect repellent capabilities of the Thermacell Repellent Camp Lantern. And when it’s time to slip inside the sleeping bag, the lantern can be separated and the base hung inside your tent for interior lighting. Another unique feature that tent campers will appreciate is the lantern’s lighting diversity. Fully assembled, the lantern can serve as your primary camp light source. When it’s time to turn in, the base can be separated from the globe and hung inside your tent. No more fumbling around with handheld lights while you’re trying to tuck in for the night. While the Repellent Camp Lantern is perfect for trailside camping or base camping, it’s also an option for backpackers. At 9.5 inches tall and 4 inches wide, the Repellent Camp Lantern fits into most technical packs with room to spare for all your other essentials. And that’s perfect if you’re planning a one- to two-day backpacking trip. You’ll be protected from insects and enjoy the full-camp lighting that comes from a serious lantern. If, on the other hand, you’re on a trip that lasts several days or is so physically demanding that both space and weight are premium commodities, the Repellent Camp Lantern may be more than you’ll want to manage. But never fear…Thermacell has an app for that! It’s called the Thermacell Repellent Appliance. Thermacell’s Repellent Appliance is perfect for long-duration backpack camping. With its light weight and small size, it fits in or on your multi-day technical pack while delivering the same bug protection zone as the larger Repellent Camp Lantern. 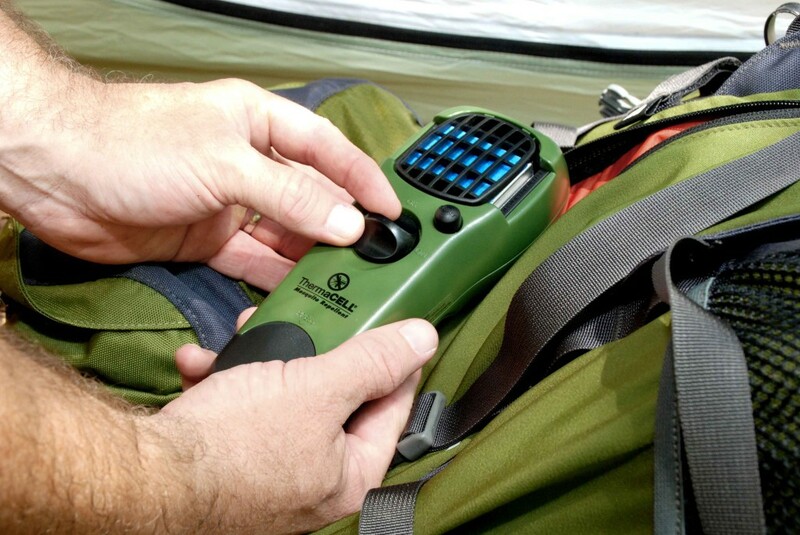 Hunters and military professionals have used the handheld Thermacell Repellent Appliance for years. Its small size and light weight allow it to be tucked into a daypack, backpack, or assault pack. And if you’re the type of hiker whose backpack is bursting at the seams when you hit the trailhead, you can simply secure it to the outside of your pack and go. Although smaller in size and weight, the Thermacell Repellent Appliance uses the same butane cartridge and mat, and delivers the same 15×15-foot dome of protection, as the larger Repellent Camp Lantern. But just because it’s smaller doesn’t mean it’s less effective at keeping those rotten mosquitoes and black flies out of your camping area. So, no matter whether you are a dedicated multi-day backpacker, an overnight hiker, or just like to pull off the trail wherever the setting sun finds you, you’ll never have to drown yourself in insect repellent again or suffer the bites and stings that come with late-season camping—Thermacell has the black fly and mosquito antidote that’s right for you.